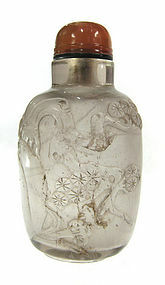 Chinese antique rock crystal snuff bottle, carved with pair of children playing on one side and twisting pine and rock on reverse. Nicely carved. Stopper made of orange agate. 19th century. Size: 3 1/4" high. 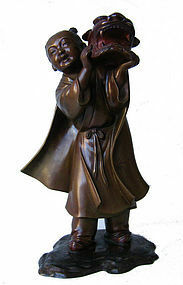 Meiji period (1868-1912) bronze of a child with beautiful a fu dog mask. 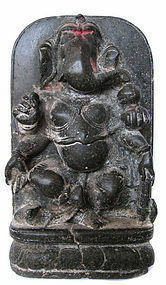 Cartouche on back of figure. 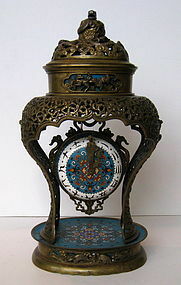 Measures 17" tall. 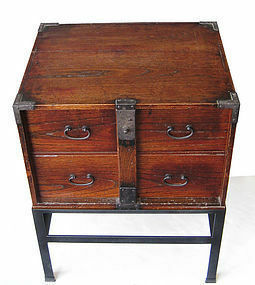 Rare and Beautiful late Edo period (circa 1850's) small bar tansu from Tohoki area in Japan. 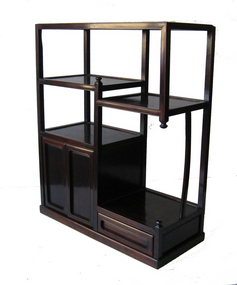 Made of keyaki Hardwood with Stunning original glowing finish, accented by round black iron handles with locking bar. Includes hand forged iron stand that supports and floats the piece off the ground. Great original condition. Measures 24" high x 18.5" wide x 14.5" deep. 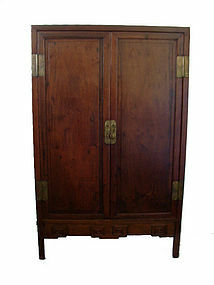 Beautiful dark finished hardwood wardrobe from the 19th century. Huang huali wood. Brass hardware. 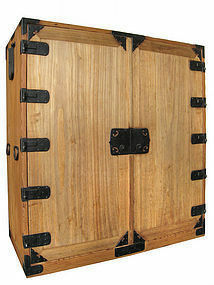 The two drawers inside are fully functional with lock and key. Inset hinges. There are keys for the drawers and doors. It measures 77.25" tall X 49" wide X 21 3/8" deep. 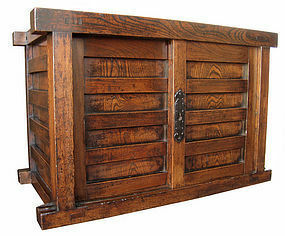 Japanese kura tansu (warehouse storage chest), made entirely of keyaki (elm) wood with very dramatic grain, thick keyaki side and back bracing, sliding panels with horizontal keyaki slats, right side has interior vertical row of 2 drawers and a hinged safe door which opens to yet another drawer, left side has interior shelf, Edo Period (c1850) Size: 23 1/4" high x 35 3/4" wide x 19" deep. 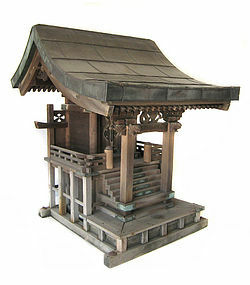 Japanese antique shinto shrine, made of hinoki (Japanese cypress) wood, wonderful details with elaborate staircase and other temple details including miniature baku, fudogs and a dragon, copper roof with nice patina, Edo Period. Size: 28 1/2" high x 22" wide x 27 1/4" deep. Japanese antique kannon biraki tansu (tansu chest with hinged doors), made of sugi (cryptomeria) wood with kiri (paulownia) wood on front, large doors with drop in iron hinges (doors can be completely removed), interior has 4 large drawers with bronze hirute shaped drawer pulls, Edo Period. Size: 35 3/4" high x 33 1/4" wide x 17" deep.